In order to accommodate a wide range of customer needs and metal press production plans, we offer everything from large makers such as Aida, Komatsu, and Amada, to more specialized machinery with unique characteristics created by smaller makers. 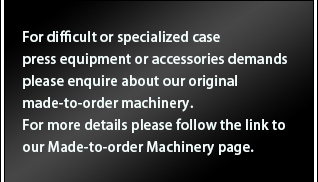 To answer customer demand, since 2001 we have been producing original machinery line-ups for specialized production needs that larger makers are unable to cater to. We found that there was market demand for smaller, more efficient machines still capable of long production loads, which gave rise to our first series, the MA-1 press. Since that time we have concentrated on strengthening our development staff and we now offer several original lines to accommodate a wide range of productions processes. 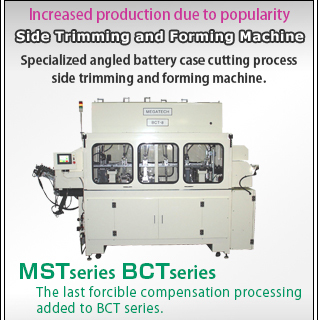 These line-ups include the MTP transfer press series, which demonstrates great diversity in high speed automated production, and the MST and BCT trimming press series which have made their mark in a difficult market with delicate battery trim manufacturing. 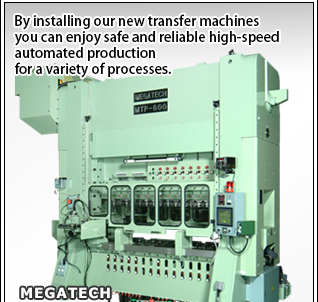 Megatech, the number one distributor of press machinery in Japan. At Megatech we not only distribute a broad array of press equipment, but we are able to offer customers consulting advice to maximize production efficiency and profit based on your processing needs. With each enquiry it is our objective to offer the customer the best machines in top condition for consistent long-term operation. Our business philosophy has won Megatech recognition from Aida Engineering as the top press distributor in Japan consistently every year since our founding. This sense of responsibility and trust has also gained Megatech Asia official recognition as a Komatsu Industries distributor and service provider in Guangdong, China. Through our close interactions with each press maker and our relationships of mutual respect, Megatech is able to offer special customized new press products from each of the larger makers catered to the customer needs. Through consultations should a more customized machine and parts be deemed beneficial for your productions needs, Megatech can carry out negotiations with each maker and see the entire customization process of a brand new press through all the way to installation in your factory.